The Elite Impulse 31 surpasses the Synergy's speed and has a shorter brace height. It might be an overstatement to suggest that last year’s Synergy put Elite on the map, given that Elite has generated a steadily growing buzz for the past nine years or so it has been in business. Still, the Synergy garnered a great deal of attention for Elite as a bow maker that is all about achieving more-than-respectable speeds without sacrificing shootability. That is no small accomplishment since almost every bow manufacturer makes the same claim for at least one bow in its lineup. The Impulse 31 takes the speed up a notch, boosting it by 8-10 fps compared to the Synergy. There are numerous ways a bow design can be tweaked to boost speed, but among the simplest and surest is to decrease the brace height. At 6 inches, the brace height of the Impulse 31 is the lowest of Elite’s bows. Seven inches was once considered a very generous brace height; today’s more compact, parallel-limb bows frequently make a 7-inch brace height commonplace. Still, 6 inches is not extremely short, and can fairly be labeled a moderate brace height (more about this later). The Impulse 31 is identifiable as an Elite bow at a glance. The recently introduced riser cage, which bridges the riser above the arrow shelf for increased strength and stability, is the most obvious tip-off. The LimbSavers on the inside of each limb are another clue, along with the unique string stop, the distinctive cams (new for the Impulse, but similar in appearance to recent models), the simple, straightforward cable guard and the multiple string silencers at each end of the string. Elite blurs the distinction between cosmetics and function, but is justly famous for producing great looking bows. The side-plate-style walnut grip, for instance, is skinny and slick (to reduce torque and encourage a consistent grip by sliding into the same spot on the hand) while adding a bit of class to the overall design. The Pro Kote protective finish is extremely durable, low-friction and non-reflective while also enhancing the bow’s overall feel and appearance. Contrasting colors on cams and various components such as the string stop and cable guard, along with metallic logos, are purely decorative. We referenced the new Impulse Cams, which contribute to the boost in speed. Also new this year are the limb pockets, redesigned for more precise alignment and hence a more stable shooting platform. To its previous array of Realtree and Ninja Black, Elite now offers KUIU patterns on its hunting bows. Not new, but reflecting Elite’s commitment to quality, are the Winner’s Choice custom strings, the Gordon Glass limbs and the previously mentioned LimbSaver limb dampeners. Did we mention fit and finish? They are, quite simply, unmatched. 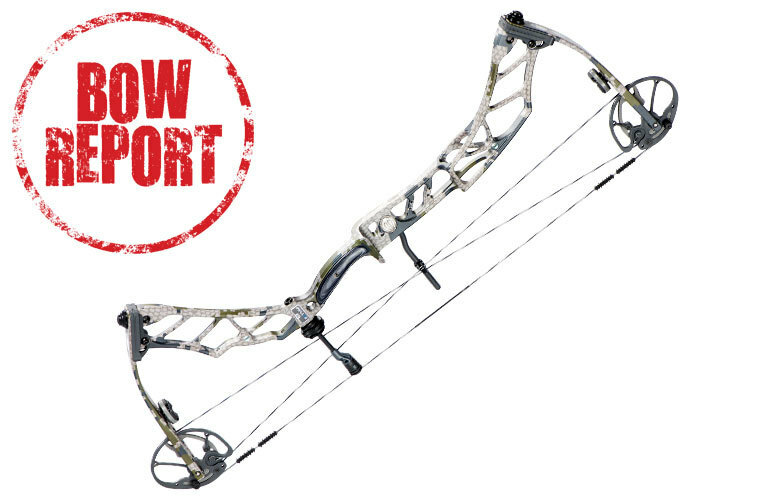 At 4.2 pounds the Impulse 31 is a medium-weight bow. It’s slightly top-heavy (as are most compound bows), though this is offset somewhat by the compact length. In any case, it’s a comfortable enough carry. Setting up the bow is fairly straightforward. Four set screws must be loosened to turn the limb bolts for weight adjustments; the limb bolts on the test bow turned smoothly with no sticking or chattering. Elite warns that the bolts should not be loosened more than two full turns. Tuning presented no difficulties and I was soon shooting bullet holes through paper. While higher brace heights have traditionally been considered more forgiving, the fact is that with today’s faster bows there is no evidence that skinnier brace heights are less forgiving. Shooters who have avoided bows with all but the highest brace heights in the belief that skinnier brace heights are less forgiving will probably be surprised to discover that, all else being equal, a skinnier brace height will have the sole effect of boosting speed. In any case, I found the Impulse 31 to be no less forgiving than any higher brace-height bow I’ve tested in recent years. A double set of sight-mounting holes are a welcome feature on Elite bows, enabling the shooter to gain a great deal of vertical adjustability as well as to move sights further in or out as desired to fit the sight ring perfectly inside a peep or to gain a longer or shorter sight plane. Somewhat higher speed aside, I found the Impulse 31 to be very similar in feel to Elite’s earlier models. The draw is indeed very smooth. The drop into the valley is a little abrupt, but not in a way that creates a harsh bump at the end (unless the shooter is overbowed). The valley is wide, and this bow is exceptionally easy to hold at full draw for an extended period. Shooters who don’t like skinny valleys with a “grabby” string will find the Impulse is the opposite of that. At the shot it pops forward pleasantly into the hand. There is a detectable but very small amount of vibration. All in all, the bowhunter who enjoys a truly pleasant-shooting bow, but desires a little more speed than Elite bows have offered in the past will probably find the Elite Impulse 31 offers the ideal combination of those qualities. For more information, visit www.elitearchery.com or call (877) 503-5483.